KIEV, Ukraine -- He is the heavyweight champion of the world, but the fight for Ukraine’s future may turn out to be the toughest contest of Vitali Klitschko’s career. “It is a big challenge to build European and democratic standards here in Ukraine,” Mr Klitschko said in an interview with the FT. The towering fighter may look awkward shaking hands with the likes of Angela Merkel, Germany’s chancellor. But he might just have the right balance of brawn, brain and backing from voters to succeed in the ring of Ukrainian ­politics. Most Ukrainians desperately want reform that would combat widespread corruption and bring higher living standards. They see the promise of closer relations with the European Union as a step in that direction. But the ever more authoritarian and kleptocratic nature of the country under President Viktor Yanukovich is putting EU integration and the nation’s fragile democracy at risk. At an EU summit on Monday, talks on a broad framework for relations with Ukraine that encompasses a trade deal are likely to be overshadowed by dismay at the opposition’s treatment. For these reasons, Mr Klitschko’s Udar (Punch) party is expected to enter Ukraine’s national parliament for the first time after elections next autumn. “When a leading opposition figure lands in prison, it smells like dictatorship,” Mr Klitschko said, referring to the seven-year jail sentence handed to Mr Yanukovich’s main rival, Yulia Tymoshenko, in October. 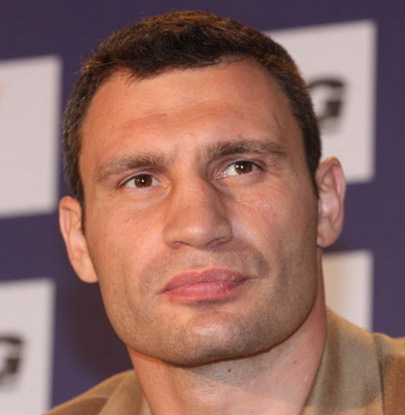 Vitali, 40, is the elder brother of 35-year-old Wladimir Klitschko. The two have in recent years dominated heavyweight boxing and between them hold all the main boxing belts in their weight class. They are respected at home and recognised abroad, often acting as informal ambassadors for their country. They command a big following in Germany, having trained and boxed there for more than a ­decade. But Vitali is not your typical slugger. He has a PhD in sports science, is softly spoken and witty. He speaks English, German, Ukrainian and Russian ­fluently. “I am drawn to politics because, although Ukraine has vast potential, it has struggled to break free of massive cronyism and corruption under existing politicians, to establish a vibrant democracy where any citizen has a fair chance to prosper,” he said. As in boxing, where he patiently waits to unleash a big punch that has knocked out some of the world’s strongest men, Mr Klitschko said he knew how to pace himself in politics. He entered public service soon after Ukraine’s 2004 pro-democracy Orange Revolution, which he and his brother supported. In Kiev’s city council he leads a dozen lawmakers who consistently stand up against corruption. His party holds about 400 seats on the councils of other Ukrainian ­cities. Mr Klitschko has his eyes on winning Kiev’s next mayoral election, and his chances are considered good. The key quality for a politician, according to Mr Klitschko, is “morality”. That is a view that strikes a chord with 46 million Ukrainian citizens who have long lost trust in mainstream politicians. “Many are sitting and waiting for something to change, not doing anything and losing hope. I want to show the way and get results,” he said. Asked if he would run for president, Mr Klitschko said his focus now was on defending Ukraine’s democracy and EU membership hopes. Many of Ukraine’s politicians talked of European values but lived in ways that contradicted them, he said.